75" x 36" x 19"
Last week my wife Christine and I had a wonderful trip to Seattle. We spent most of the week visiting with some of the area artists whom I represent. One of the reasons we chose that particular week to visit Seattle was that Maestro Lino Tagliapietra was Artist in Residency at the Museum of Glass in Tacoma. We spent most of our first day there in the hot shop watching Lino and his assistants blow some of the largest vessels Lino has ever made. The final piece of the day was an extraordinary piece from the “Fenice” series. The “Fenice” piece pictured here is not the one we saw Lino create but is a great example of that series. That evening we enjoyed a wonderful Japanese dinner with Lino and his wife Lina, Cecilia Chung (Lino’s business manager) and her husband Tony Leung. It is always a pleasure to watch Lino work and also to share a leisurely meal together. Our second full day in Seattle was spent at the Chihuly Boathouse on Lake Union and at Ballard Studio. At the Boathouse we enjoyed watching Team Chihuly blow the bottom portion of an” Ikebana piece.” Gaffer Jim Mongraine and the other team members work together so smoothly that it almost made the creation of this beautiful vessel look easy! The “Ikebana” image pictured here is an outstanding example of this wonderful organic series. At Ballard we got a sneak preview of a couple of the large installations which are scheduled to be installed next spring at Seattle Center near the Space Needle. Between visiting the Boathouse and the Ballard studio we had a great seafood lunch with Chihuly employees Michael Hytinen and Paula Jacobson. 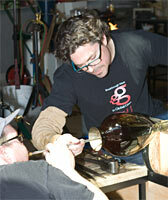 Our remaining days in Seattle were spent in visits with a number of other Seattle glass artists. We enjoyed visiting Preston Singletary’s studio and seeing a new body of work which he has been working on over the past few months. Preston’s work has evolved dramatically in the 5 or so years that I have represented him. His traveling museum show which began at the Museum of Glass in Tacoma is currently at the National Museum of the American Indian in New York. Preston’s beautiful new piece which is pictured here is titled “Tlingit Basket-Blue Smoke” and is one of the largest of his Basket series I have seen. It was great to visit the studio of John Kiley and to see many pieces there in various stages of completion. John’s cold work studio is in Ballard, very near the studios of Chihuly and Martin Blank. It was interesting for us to see the different cutting and polishing machines that John uses in the making of his pieces, almost all of which involve joining two or more bubbles of glass in different colors. Asymmetric Overlap, which is pictured here, is a great example of John’s current work. We were not able to visit the studio of Nancy Callan as she was very busy assisting Lino at the Museum of Glass. However, it was a special treat to have a superb Indian dinner with Nancy and her partner Julia. Nancy is not only one of my favorite artists but also a good friend. The piece pictured here, “Ashera Orb,” is part of Nancy’s new Orb series. Enjoy your summer and keep in touch. As always, your comments and questions are most welcome!